The dictionary specification provides so called "interface" of the graph and is always required, even, for example, when the graph is used with Launch Service. In the source code, the entries of the dictionary are specified inside the <Dictionary> element. To create a dictionary, right-click the Dictionary item in the Outline pane and choose Edit from the context menu. The Dictionary editor will open. Click the Plus sign button on the left to create a new dictionary entry. Specifies the name of the dictionary entry. Names are case-sensitive and must be unique within the dictionary. Generally, a dictionary name does not have to be a valid Java identifier. For example, a dictionary name in the >File URL attribute does not require this condition to be met. We recommend using legal Java identifiers since an access to a dictionary in CTL requires the dictionary name to be a legal Java identifier. Specifies whether the dictionary entry can be used as an input or not. Its value can be true or false. Specifies whether the dictionary entry can be used as an output or not. Its value can be true or false. Specifies the type of the dictionary entry. boolean, byte, date, decimal, integer, long, number and string. Any of these can also be accessed in CTL2. For detailed information, see Dictionary in CTL2. For further information about multi-value data types in CloverDX, see Multivalue Fields. For example, if you create a dictionary entry of the type list and set the Content Type to integer, you can access the entry in CTL2 as integer - a list of integers. Similarly, if you create a dictionary entry of the type map and set the Content Type to number, you can access the entry in CTL2 as map[string, number] - a mapping from string keys to number values (the keys are always assumed to be of the string data type). object - CloverDX data type available with CloverDX Engine. readable.channel - the input will be read directly from the entry by the Reader according to its configuration. Therefore, the entry must contain data in valid format. This specifies the content type of the output entry. This content type will be used, for example, when the graph is launched via Launch Service to send the results back to user. A default value of an entry - useful when executing the graph without actually populating the dictionary with external data. Note that you cannot edit this field for all data types (e.g. object). 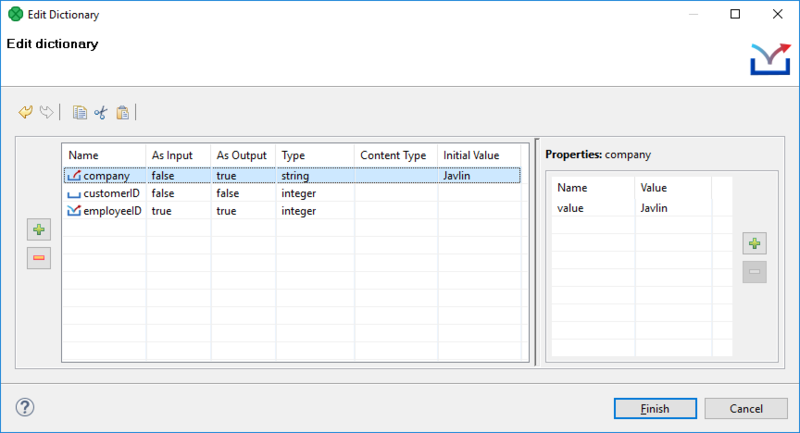 As you set a new Initial Value, a corresponding name-value pair is created in the Properties pane on the right. Initial value is therefore the same as the first value you have created in that pane. Specifies the name of the value of corresponding entry. Specifies the value of the name corresponding to an entry.